Get lost in this beautiful narrative adventure—and then do it all over again. 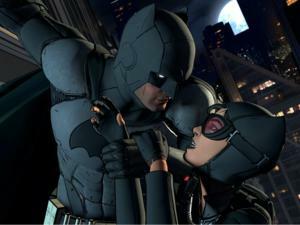 Classic point-and-click adventure games have evolved over the years and recently saw a revival with Telltale’s successful episodic series. Based on licensed properties ranging from The Walking Dead to Minecraft and Game of Thrones, the games take the form of an interactive version of the classic choose-your-own-adventure books, letting you make decisions that gradually lead to different conclusions. No matter the story, however, you can expect something bold and exciting, and filled with action. 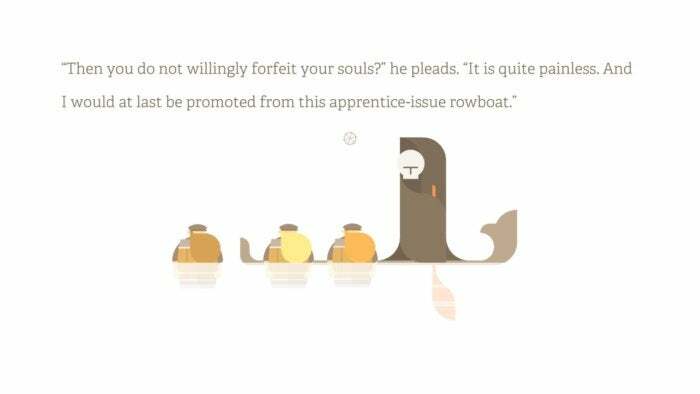 Burly Men at Sea takes a much calmer approach. It’s a visual and story-driven affair still, but as the intro screens suggest, it’s “a quiet adventure” from developer Brain&Brain. That tone shines through in the storybook-like presentation, the beautiful tunes, and the clever written dialogue from the bulky fishermen and the various people and creatures they encounter along the way. Every story starts and ends here, but what’s in between can shift. 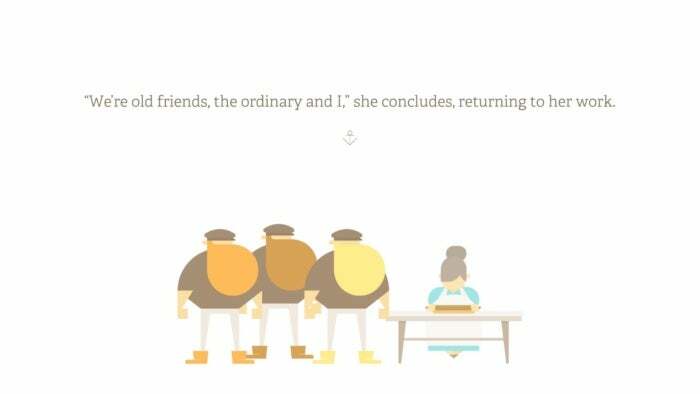 While Burly Men at Sea may indeed be a quieter adventure than most, don’t mistake that for simplicity. Some will debate whether it’s even a game, given the lightweight interactivity, but this narrative quest has some surprises along the way. After your first brief play-through comes to a close, you’re nudged to go back in and see what other adventures await—and sure enough, the Brothers Beard can take other paths and discover further amazing things. And you can, too—wherever you are—thanks to this incredibly-pleasant iPhone and iPad game. Ready to embark on a voyage? Here’s why Burly Men at Sea is such a treat. 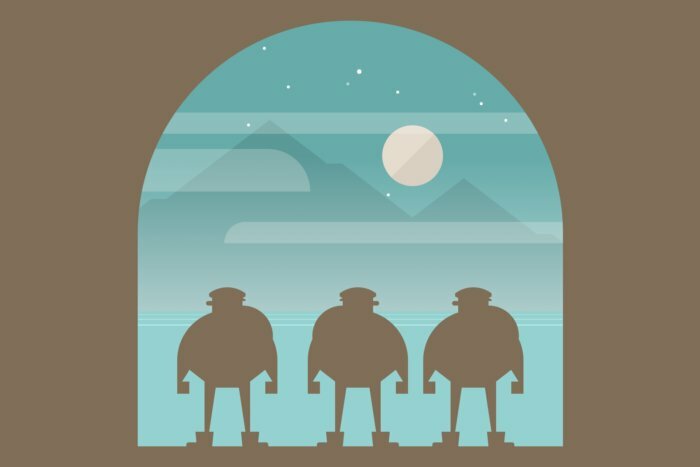 It’s like a storybook: Burly Men at Sea almost feels like a children’s storybook, albeit one that you can explore, poke, and prod to see what happens. Most of the time, the brothers are huddled into a small circle at the middle of the screen, and you can pull to expand that circle left or right to see what else is nearby. As the image expands, so too does the storyline, as you chat with a local coffee shop owner, mystical nymphs… or the grim reaper sailing by on a boat. One of the many interesting characters you’ll encounter. 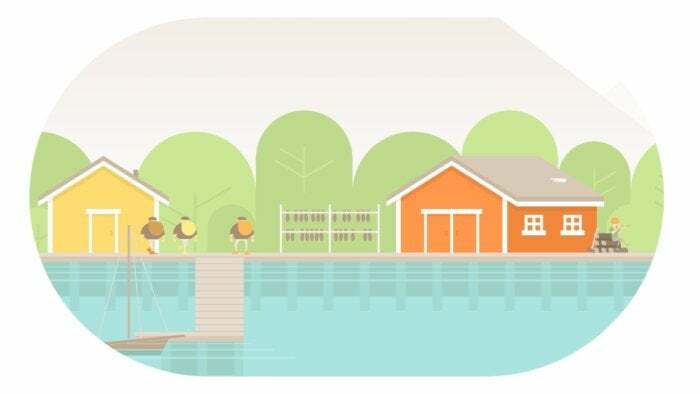 Designed as a folktale and set in Scandinavia in the early 20th century, there’s a grand sense of adventure to the story despite its relatively compact size—and, of course, its existence on your handheld device. The delightful dialogue is consistently clever and funny throughout, and really encourages you to seek more from the game’s world… if only to read more of it. However, it’s not the only part of the game that’ll have you singing its praises. It feels handcrafted: While the game was coded using computers, it feels positively shaped by human hands. Brain&Brain, a husband-and-wife duo who previously made the darling Doggins, clearly poured a lot of love and attention into making Burly Men at Sea feel not only original, but also infused with warmth and enchantment. The minimal graphic style still packs in a lot of detail within its simple shapes, as seen with the flying birds and ripples on the water, and showcases a lot of personality too. It’s paired well with the audio here, with sound effects—like the “chink” of a blacksmith’s hammer—provided by human voices, and the lively backing music likewise perked up by horns, accordions, and well-placed chants. It’s a real joy. And there’s no one path: You might finish Burly Men at Sea in about 30 minutes and think, “That’s it?” It’s a fair question. But really, that’s not it. 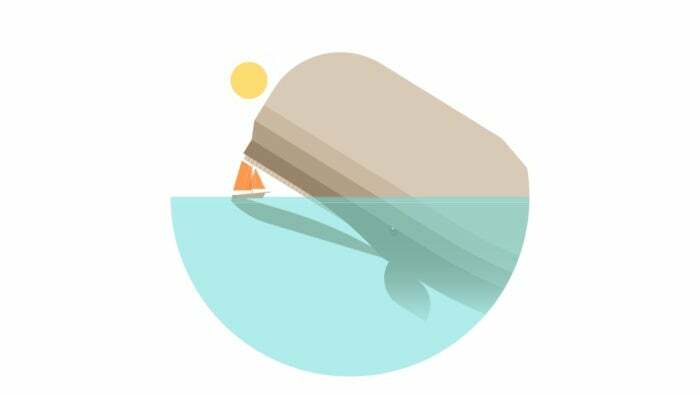 You’ll start another game and find that the first couple steps are mostly identical, but from there you’ll notice additional options—another choice once you’re stuck in the belly of a whale, or multiple possibilities once you undergo a certain transformation beneath the sea. I find this statement incredibly fascinating. It’s not that you get a dozen completely different games in one here, but each new version of the story unearths new wrinkles and takes the brothers in a fresh direction. Given the immense atmosphere of the game and the splendid writing, these deviations provide incentive to stick around and explore, and find out just how many amazing adventures the Burly Men at Sea can get themselves into.